The Basilica of Saint Peter is is the largest church in the world of any Christian denomination and is believed to be built over the grave of the Apostle Peter. A basilica is a Greek word meaning a royal building. It was appropriated by the Romans for law courts and official buildings which generally had three aisles in them. When Christianity was legalised by the Roman Emperor Constantine in 313 AD, Christians started to build their major churches in the basilica format to emphasise the officiality of the religion. Peter, along with his brother James, was a fisherman and one of the first Apostles or Disciples called by Jesus. He is generally recognised as being leader of the Apostles/Disciples by most Christians and the Catholic Church officially regards him as the first Pope, from Papa or father, or Bishop of Rome. Many others regard James the Just, the half, step or possibly full brother of Jesus to have taken over leadership of the group. In the 60s AD Peter (whose original name Simon ben Jonah or Simon Johnson) was preaching in Rome and was martyred here during the reign of the Emperor Nero. Nero blamed the Christians, a small sect back then, for starting the Great Fire of Rome. Tradition records him as crucified upside down in a chariot racing track or circus which sat on Vatican Hill in Roman times. The Christians in Rome removed Peter from the Cross and buried him in an adjacent cemetery with a simple inscription; Petros Eni – Peter lies within. When Rome got her first Christian Emperor 250 years later, Constantine, he built a basilica (or royal building) over the grave of the Apostle in 326 AD. As the tombs of Jesus and Mary were unknown or not found, the Basilica of St. Peter became one of the holiest sites in Christianity and hundreds of thousands of pilgrims would visit the church of the prime apostle, particularly those who were not in a position to visit the Church of the Holy Sepulchre in Jerusalem. By the 1500s this Constantinian basilica is in disrepair and is costing a fortune to repair and keep. Pope Julius II decided to build a new church on the same site, knocking the old one down over time. Work started on the current St. Peter’s in 1506 and was completed 120 years later in 1626. In that time the church had several architects such as Bramante, Raphael, Da Sangallo, Michelangelo, Fontana, Della Porta, Maderno and Bernini supervising a daily crew of 2000 workers. The church was built in a Latin Cross plan and the inside of the church was decorated by Bernini; only two statues were saved over from the old church to sit in the new. Bernini and his workshop sculpted the majority of the statues inside although space was left for funerary monuments for future Popes. The cost of the basilica was colossal and indulgences were sold by the church to finance the construction costs. The sale of these “purgatory passes” was a major cause of the Protestant Reformation. A cathedral is latin for chair or seat of a bishop. Bishop is an anglicisation of Episcopus; Latin for overseer or supervisor of priests. St. Peter’s is the seat of the Bishop or Rome, the supervisor of the Church – the Pope, from Papa or father. Officially Jesus is the head of the Roman Catholic (and other Christian) Churches, the Pope is the administrator. There were four episcopal or bishoply sees: Rome, Constantinople/Istanbul, Alexandria and Antioch but as Peter was considered to be buried in Rome, the church in Rome claimed prominence. Probably the most famous statue inside St. Peter’s is Michelangelo’s La Pieta. Many of the smaller chapels were decorated with large mosaic recreations of paintings which are elsewhere in the vatican. Inside the church is composed of minor chapels dedicated to a Saint, Pope or specific function such as the choir chapel, and there is a large expanse around the Baldacchino which sits beneath the dome. The Baldacchino and Dome are directly in line above the grave of Saint Peter, his remains were not moved, the church was built over him. St. Peter’s is free (as are all Catholic Churches) and is very popular. There is usually a line or queue for the church and this can vary in length due to time of day and season. You can skip the line for St. Peter’s by going through the Vatican Museums and exiting the Sistine Chapel bottom right to the Basilica. Bear in mind this door is closed most Wednesday mornings for Papal Audiences and can be closed on random days without notice, so you may have to walk around the museums and line up to get inside. At maximum the line for St. Peter’s is one hour and the start point is located in St. Peter’s Square. If you book a tour through me you will experience no line as the official guides I use have the ability to skip the line for St. Peter’s Basilica. 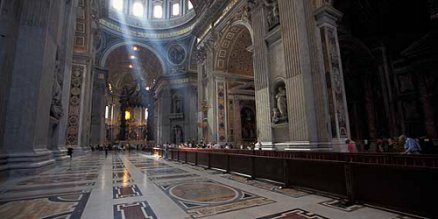 St. Peter’s is one of the most beautiful and impressive churches in the world. It is included on all tours organised by me, unless you request for it not to be. It takes one hour to view properly. Photos are allowed inside without flash. You must have covered knees and shoulders to enter the basilica. Dara was an excellent guide, knowledgeable and added a nice touch of humour to the tour. We really enjoyed ourselves on the tour. Very informative and Dara has an excellent sence of humour. This was the most enjoyable tour of our entire two week vacation to Italy. Dara was quite knowledgeable and interjected fun facts and humor which made it even more engaging for our children – ages 20, 17 & 15. He was always respectful of the faith and reminded us of the rules, other tour guides must not have been as informative. The tour was great, after talking with others on our cruise we got the better deal as they went on the cruise sponsor tour. I do have 2 items to help with improvements. I know you may not be able to do this one and it may be out of your control, but benches would be great when listening to the information on the Sistine Chapel. The second, the guides need better microphone, when they turn their head the mic stays put and you lose volume. My party all agreed that it was a great tour. Debbie.